Enjoy a fast and fun floor cleaning experience with our #1 Spin Mop*, which features hands -free wringing thanks to our foot pedal spin mop design. *The EasyWring #1 Spin Mop claim is based on IRI, Total US MULO, L52wks 9/9/18, Consumer Focused Durable Mops dollar sales. The foot pedal on the bucket allows for hands-free wringing, so you have less mess when mopping. Control the level of moisture of your mop with the built-in high-quality foot pedal designed to activate spin wringing. 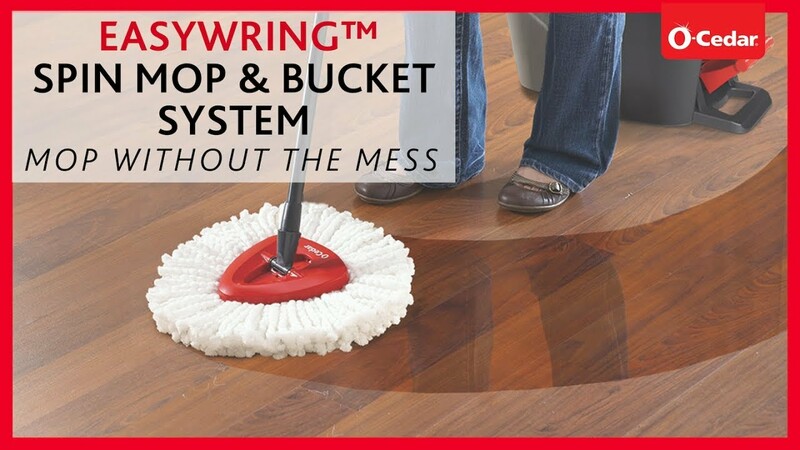 The EasyWring™ Spin Bucket & Mop gives you the ability to control the amount of water and moisture applied to floors making for easier wringing and quicker-drying floors. The deep-cleaning microfiber removes and absorbs tough dirt and grime leaving floors clean and dust free. Machine or hand wash. Do not use fabric softeners or bleach. Lay flat to dry. For best results, change refill every 3-6 months. Store bucket in dry conditions. Do not expose to excessive sunlight.